This tiny autonomous car will be powered by advertisements. Coming soon to a UK pathways. RDM Group, the firm responsible for the LUTZ Pathfinder — a single seat autonomous car that drives on paths — plans to launch multiple new pods at this week’s Automechanika event. 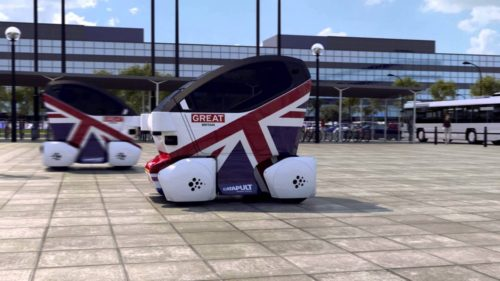 The firm will launch three new driverless pods that fit two, four, and eight people, according to the Coventry Telegraph. See Also: Will Tesla go fully self-driving before the Model 3? Unlike other automakers that are attempting to build autonomous systems into pre-existing models, RDM Group went for a striking redesign with the PathFinder. We should expect a funky design for Pod Zero, which RDM claims is perfect for airports, shopping centers, and theme parks, where transport is limited. Promotional video for RDM Autonomous vehicle project. RDM is banking on advertising to be the money maker for its driverless project. Instead of the person sitting inside the pod focusing on the road (or path), it wants them to interact with the iPads during their journey. “We have taken learning from the LUTZ project and moved it on significantly so we now have a manufacturing process that could be ramped up to meet more than £15m of anticipated new orders,” said Keene. The LUTZ project was part of the UK Government’s Transport System Catapult Autodrive project. The new pods will have a range of 60 miles, not great when compared to cars, but enough for short trips in public places. It has a top speed of 15 mph, which should allow Pod Zero to remain on the pathways. RDM has also ensured that the pod is accessible for disabled people and has provided wheelchair access. Pods might be one of the emerging technologies that we’re just starting to see enter the market. We’ve already heard that disabled and old people will benefit the most from self-driving, and the pods could be another way for people with difficulties walking long distance to get around easily. Originally published at readwrite.com on June 8, 2016.